Sometimes the most important thing you cook is a side dish. We were invited to a pork dinner that we knew would be fantastic. The hog itself, tucked into our friends’ industrial freezer, was already stuff of legend. All we had to do was choose whether to bring a side or a dessert. We chose side. 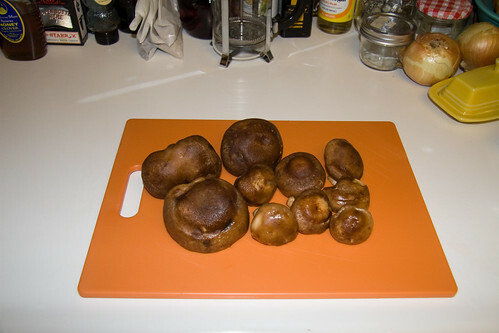 Browsing the Farmers’ Market the morning of the meal, I happened upon some glorious shitaki mushrooms. 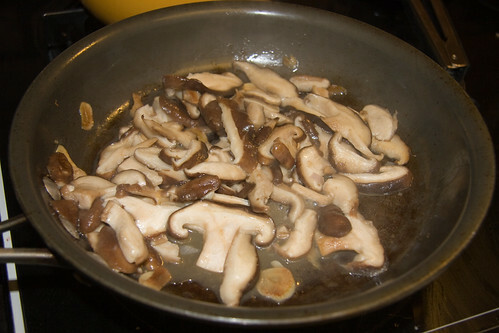 I’m generally bullish on mushrooms of all kinds, and the shitakis that Solano Mushroom sells may be the most impressive I’ve seen. They were nice and full and appeared to have been very gently handled. I happily snapped up half a pound of them, then browsed the other tables to figure out what I was going to cook with them. 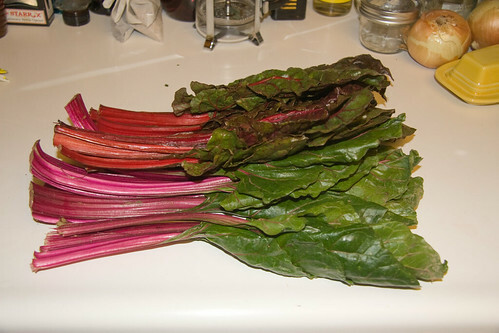 Visiting the folks at Capay Organic, again, I picked up two bunches of rosy chard, as well as some collard greens for a Fifty Two Foods practice run. Having both leafy greens and mushrooms in hand made for an obvious choice—creamed chard with mushrooms—since mushrooms take to cream so well, and there’s nothing quite like creamed chard for a hearty yet refreshing side dish. 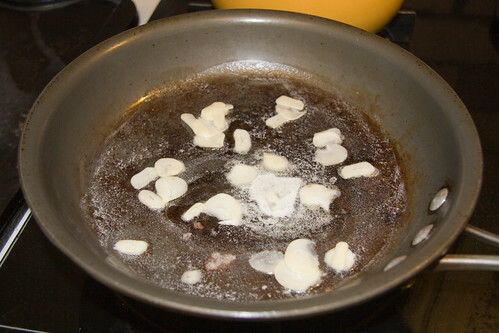 I sliced the shitakis into good sized slices, then sautÃ©ed them in butter and garlic until they softened and the juices ran out. The garlic I sliced very thin, and cooked slowly in the butter before adding the mushrooms, allowing it to soften and caramelize a bit. It tasted a lot like roasted garlic, but instead of soft, thick pieces, they were thin and crispy. The garlic alone was absolutely delicious. 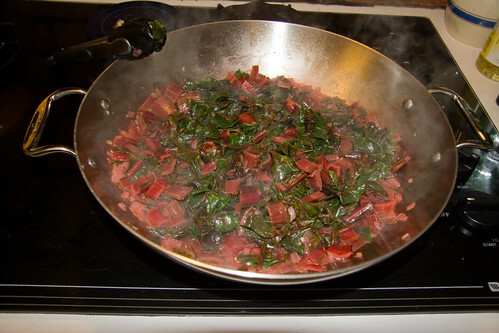 In another pan, I sautÃ©ed a minced shallot in olive oil, then added the chard stems, which cooked for 5-10 minutes before I added the roughly chopped chard leaves. 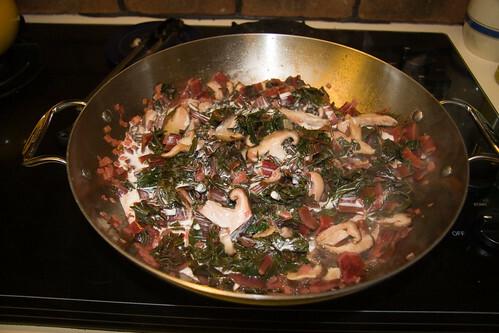 I added a bit of white wine, then covered the chard to let it soften for another 10 minutes, or so, before adding the entire contents of the mushroom pan. Finally, I added two ounces of heavy cream and stirred everything together for a couple minutes. The shitakis added a fantastic earthy taste to the chard, elevating a dish that already would have been tasty to a profound complexity. It paired very nicely with the pork we had, but could also have served well alongside any roast or grilled meat. Check out all the pictures here.